There are many different balustrade systems available on the market today but how do you know which one is right for you? Perhaps you are someone looking into Balustrade Systems for the first time and would like to know which one is best suited to you. Of course you are welcome to give us a call if you would like to know more, but in this article we go through some simple reasons as to why and which systems are best suited for the job. The ‘Post & Rail’ balustrade system offers circular stainless steel posts with a stainless steel handrail that runs along the top. This system is perfect for any indoor or outdoor stairways or corridors that will want to provide an aesthetically pleasing strong and sturdy handrail for support and guidance. The beautifully crafted glass panels sit slightly raised off the floor and are perfectly suited for all spaces. Main Features: Circular posts, Handrail, Glass panels with gaps between floor & glass panels. The ‘Post & Rail Square’ balustrade system offers the exact same advantages as the ‘Post & Rail’ balustrade system, the only difference is; it has square stainless steel posts. 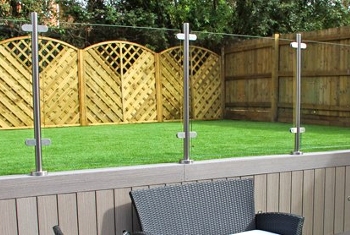 Choosing between circular or square posts is down to personal preference as they are both extremely strong and durable. Popular For: Stairways, Corridors, Balconies – for people who want to add a resting point. 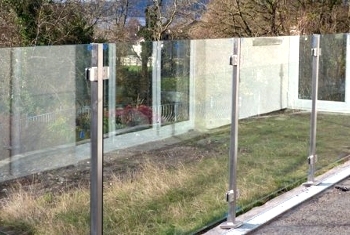 Main Features: Square posts, Handrail, Glass panels with gaps between floor & posts. 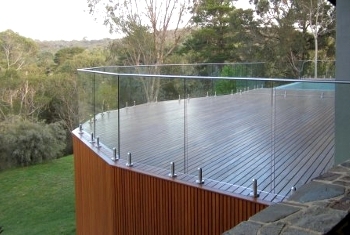 The ‘Ultimate’ balustrade system offers circular stainless steel posts but with no top rail. This system is perfect for indoors or outdoor use. It is really popular for being used in places like patios and gardens and for people that want to add separation but don’t need a handrail. These balustrade systems are perfect for creating privacy; as like all our balustrade systems they come in a choice of frosted, tinted or clear glass panels. Popular For: Patios & Gardens. 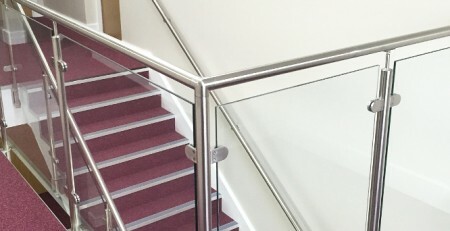 The ‘Ultimate Square’ balustrade system offers the exact same advantages as the ‘Ultimate’ balustrade system, the only difference is; it has square stainless steel posts. Choosing between circular or square posts is down to personal preference as they are both extremely strong and durable. 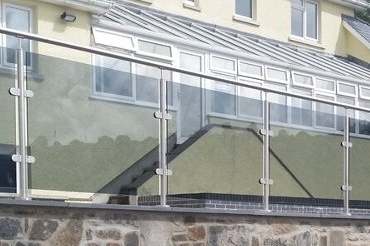 The ‘Frameless Top Rail’ balustrade system offers an aluminium shoe channel which holds the glass panels in place and comes complete with a top rail. This system fits flush to the floor and the glass sits side by side. This system is perfect for indoor or outdoor use and is really popular for use on balconies. The shoe channel allows the glass to sit close together and doesn’t impact on the view . The handrail offers a strong and convenient way to lean and hold on to. Like all our balustrade systems they come in a choice of frosted, tinted or clear glass panels for your choice of privacy. Popular For: Balconies – for people who want to add a resting point. 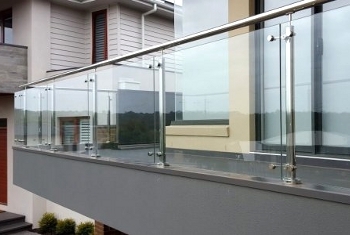 The ‘Frameless no top rail’ balustrade system offers the exact same advantages as the ‘Frameless Top Rail’ balustrade system, the only difference is; it has no handrail. Choosing between a handrail and no handrail is down to personal preference as to whether you want your balustrade system to be used for support and guidance or more of a feature. Main Features: Shoe Channel, Glass panels with no gaps. 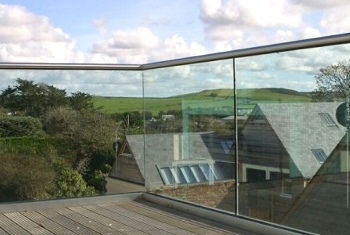 The ‘Glass Button’ balustrade system offers the ability to secure the glass balustrade to the vertical side of a surface using attractive stainless steel button fixtures. This system avoids taking up floor space, so is great for places where space is limited. It is also perfect for anyone that would like the glass to run down the side of a wall. It is really popular on balconies and alongside corridors. Popular For: Fixed to the vertical side of a surface. Main Features: Button Fixture, Glass panels fixed to a vertical surface with or without gaps. The ‘Spigot’ balustrade system offers the ability to secure the glass balustrade to a flat horizontal surface using beautifully shaped spigots. 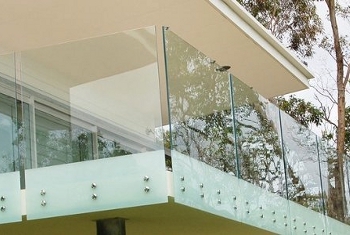 This balustrade system is great for anyone that wants the glass to sit side by side, but who doesn’t want to have an aluminium shoe channel along the bottom. Popular For: Fixed to the floor with spigots. Main Features: Spigot Fixtures, Glass panels that sit together with slight floor gap. 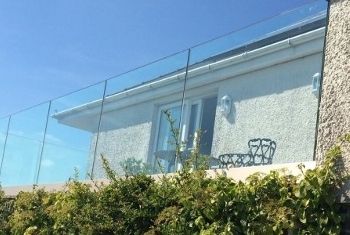 The ‘Wire Rope’ balustrade system offers beautiful posts with a top rail and is perfect for anyone that would like an attractive handrail, but who doesn’t want to have any glass panels. Main Features: Circular posts, Wire Rope, Top Rail. 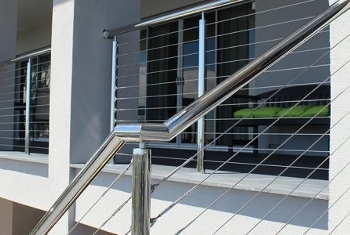 All our balustrade systems are perfect for indoor and outdoor use and they can be customised to your specific needs. If you need any help with your selection then please don’t hesitate to get in touch. We are always happy to talk you through and help you with selecting the right balustrade for you.